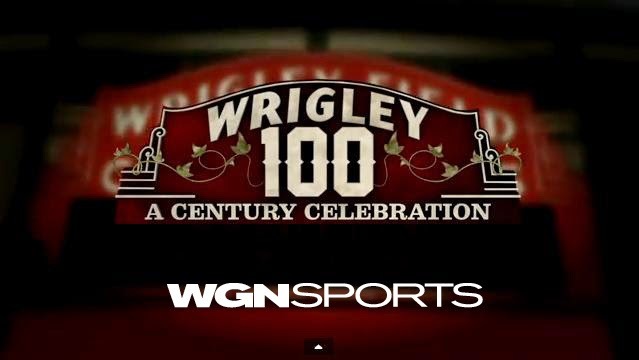 This Sunday, WGN will air a two-hour special titled: "Wrigley 100: A Century Celebration" to honor the tie between WGN and the Chicago Cubs. The program will air at 8 pm ET, 7 pm CT.
Narrated by WGN Radio’s Steve Cochran and featuring custom drawings by cartoonist Drew Litton, the magic moments and memories of a century of baseball at Clark and Addison are told via interviews with over 60 different people, including Hall of Famers Ernie Banks, Billy Williams, Fergie Jenkins, Ron Santo, Andre Dawson, Greg Maddux and Ryne Sandberg; as well as Kerry Wood, Rick Monday, Rick Sutcliffe, and Derrek Lee. Visiting greats such as Hank Aaron, Vin Scully, Mike Schmidt, Albert Pujols, Bob Uecker and Paul Konerko will add their thoughts as well. 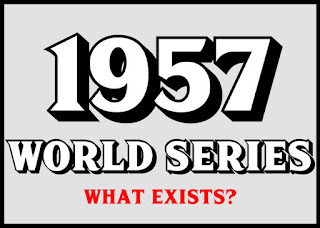 Other segments include Mike Ditka and Gale Sayers on playing for the Chicago Bears at Wrigley, fun and crazy moments at the park described by Harry Caray and Jack Brickhouse, and an in-depth look at some of Wrigley’s greatest games. Here is a YouTube clip of the intro to the special. WGN has a special bond with this blog simply because a majority of our color content has come from surviving WGN specials. I have contacted WGN in the past and they have told me on a few occasions that a cache of classic broadcasts aren't hidden away somewhere. What we have seen is what exists. I don't know that to be 100% true, as things can be mislabeled or misplaced but I would imagine if there is something new, we might see it on this weekend's show. "he means the tying run at the plate now..."
Those were the words Vin Scully uttered as Aaron stepped into the box to face Al Downing for the second time on that fateful April night. It is Masters weekend in the state of Georgia and it just so happens that this week's post is going to stay in the state for the second week in a row. In fact, it's going to stay focused on the same game as last week. Two years ago, follower of the blog and fellow amateur sleuth twib77 and I were discussing some clips we saw in a MLBNetwork Prime 9 special about Rule 5 Draft picks. One such draft pick was Darrell Evans. Evans was drafted but did not sign four times before finally agreeing to terms with the Kansas City A's. He would, however, not play a game in the Majors for the A's. He was chosen in the 1968 Rule 5 Draft by the Atlanta Braves He would eventually play 21 seasons in the Major Leagues, occupying both corner infield positions and in the Top 10 in walks 15 times in his career. 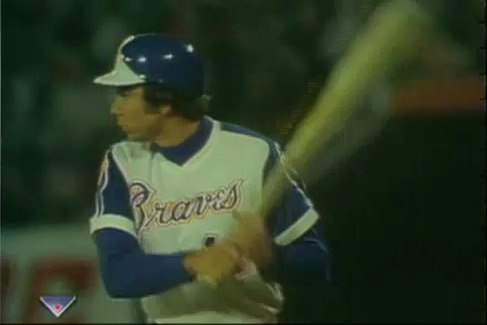 Evans made a career of getting on-base and doing so in the game in this shot made him a part of history. In the fourth inning of the April 8, 1974 game vs the Dodgers, Evans would reach on an error by the Dodgers' shortstop. 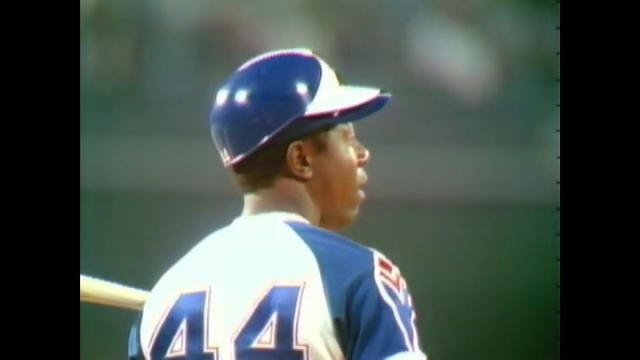 Standing at first, he would be 90 feet away from Hammerin' Hank as he blasted career homerun 715.